My last few comic shows have been arts festival-style, focused on artist appearances and their self-created comics, so it was a bit of a shock to attend a much bigger, much louder, more traditional “let’s look at stuff” comic convention in C2E2 2014. I think of these types of shows as similar to Disneyland — people attend to see the sights, whether it’s cosplayers, big booths, celebrities, or presentations of what publishers have coming next. (ICv2 felt similarly: “The nature of comic conventions is changing as they grow and the types of attendees broaden.”) I was only able to attend C2E2 Friday, due to a conflict with tickets for a comedy show, so my experience may be skewed for that reason as well. 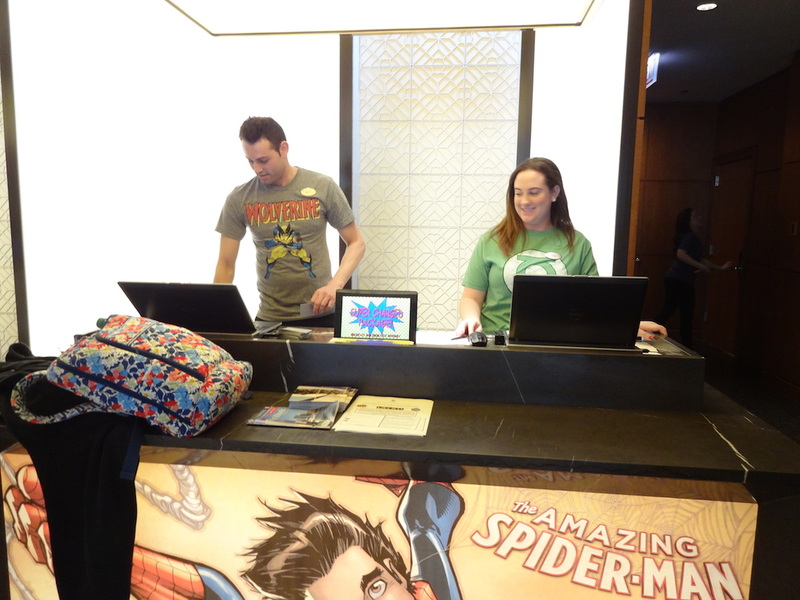 The con hotel staff had been outfitted with superhero t-shirts, and all the check-in desks had Marvel art (because DC didn’t get back to them in time). Clearly, the hotel was playing along with the experience. My goals at a show these days are twofold: To catch up with friends, and to find reading material, most often from self-publishers, new to me. This show was not great on either count. To be fair, the first becomes harder as everyone gets older, since shows these days require a good investment of time and money, and with so much on the internet, it’s easier to stay home. (Less money spent, and no aching feet from hiking the huge show floor!) I don’t want to denigrate the folks I did love seeing and catching up with, because those conversations were terrific, but overall, there were fewer chances to do so than I hoped for. The second, finding great new comics, was not promising, either, since so many of the artist alley participants were either 1) big-name creators who needed a place to sign items for fans or 2) aspiring creators selling prints and pinups, not comics. The first happened because few big publishers attended the show, so artists didn’t have those locations for signings. Marvel, Dark Horse, and Boom! were the standouts who did appear, and it was a pleasure to finally get a chance to meet DH’s Aub Driver, one of the nicest and most effective publicity people in comics. Finding out that Thom Zahler (Love and Capes) has written an episode of Ultimate Spider-Man that will be airing by the end of this year. I got one of the promo eyeballs. I enjoyed the two digital comic panels I attended, and I learned new ways to look at the medium. I was pleasantly surprised to see several book publishers at the show, including Penguin and Random House, although attendees seemed shocked that they were giving away free books! A fabulous dinner with Brigid Alverson, Sean Kleefeld, Michael May, Anthony Del Col (Kill Shakespeare), and Beth Scorzato of Papercutz. Celebrities: I met Israel Idonije and Molly Quinn (Castle, Supergirl)! I bought nothing, so at least that saved me some money, which I spent on food. $25 for a con hot dog lunch for two! $36 for hotel breakfast for two! I can afford it, but when you’re wondering how well exhibitors are doing at the show, this much money going to meals is a contributing factor. I’m not sure C2E2 can be considered a national-level show yet, and the overall feel was similar to a Wizard World. The difference is that WW gets older celebrities — Dean Cain, Adam West, those kinds of nostalgia names. Every time C2E2 sent out a “new guest announced!” email, I found myself wondering “who?” A lot of that was because I don’t watch The Walking Dead or Game of Thrones, but the “entertainment guests” were generally younger and lesser-known. So, looking back, although the change in what comic shows are about makes me melancholy, overall, if more customers are exposed to comics and buying them, that’s a good thing. (The shopping part, though, is the part I’m not sure about.) When comics was a small shop, shows were about catching up; now they’re spectacles. Changing times. I’d go back next year, although maybe just for a very long Saturday.